This is no ordinary lycanthrope tale, but is instead driven by a highly empathetic beast. Something very weird is happening in the sleepy town of Grand, Oklahoma. A string of animal attacks occurring on full-moon nights starts a rumor mill that becomes a flood. In Aaron Meade’s fantasy novella A Wolf among the Sheep, the weirdest rumors prove to be shockingly true. The real meat of this short work concerns three friends—Eric Martinez, Christian “Chris” Morgan, and Brandon Hank. One night, during one of the trio’s usual outdoor excursions, a strange creature—it appears to be half-ape and half-wolf—attacks one of them. Instead of dying, the young boy heals and is convinced that his attack was nothing more than a nightmare. The other two play along. Years later, Eric dies on the morning of his wedding. The police blame it on an animal, but Sarah, Eric’s fiancée, is not convinced. Her solitary investigation not only reveals that the Hunka, a folkloric creature, is on the loose, but that her innocent soul may need to be forfeited in order to achieve vengeance. 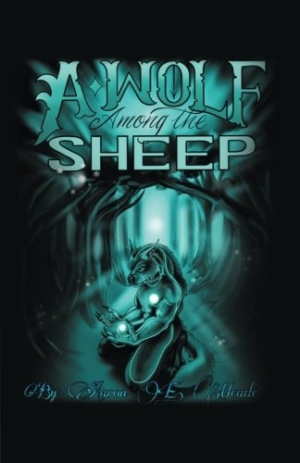 A Wolf among the Sheep is a fast-moving story that blends elements of a mystery with the supernatural. Its characters are mostly ciphers, with the exception of Sarah; they have little substance beyond the fact that they are mired in a terrible crime spree. Constant fluctuation in the narration, with first- and third-person perspectives oscillating randomly, further confuses the mix. Noticeable errors with punctuation, capitalization, and grammar impede reading, with lowercase letters beginning sentences and necessary commas omitted. Dialogue has an artificial flavor, and crucial conversations are sometimes hard to believe. Many of the book’s passages have a movie-script quality, placing it in the realm of contemporary pulp fiction. The story progresses at a pace that is too fast for its own good. Its various plots and concepts are lightly explored, without enough explanation to fully flesh out its developments. Progression through the story is enjoyable, though the mystery is solved early on, and the scares it provides aren’t severe enough to file this with horror novels. The creature at the heart of the book is one of its saving graces. This is no ordinary lycanthrope tale. Besides incorporating Native American lore, the story is driven by a highly empathetic beast—it always apologizes before devouring its prey. Such scenes, along with moments in which the beast’s victims are transported to a spirit realm, give the novella an appealingly surreal quality. A Wolf among the Sheep is a bizarre werewolf tale whose appeal resides in its strangeness.